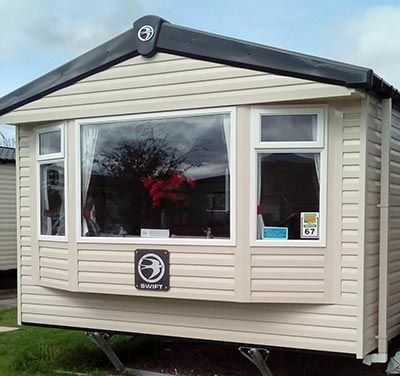 This luxury Swift Loire 36ft x 12ft extra wide holiday home sleeps 6 in 3 bedrooms (one double and two twin rooms) provides excellent family accommodation. 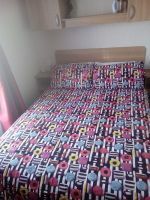 For additional comfort the caravan has double glazing throughout and has electric plinth heaters in all the bedrooms. Situated on the very popular willow Grove close to all the amenities including the theme park, swimming pool, club house, launderette and shop. 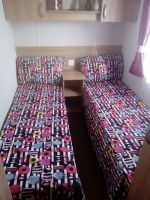 Upon entering the caravan you will be taken aback by the modern spacious interior. The lounge is spacious and comfortable with ample room for the whole family and is equipped with a large TV, DVD player there is a contemporary wall mounted electric fire there is a dining area set to one side. In the kitchen can be found a full size gas cooker, fridge, microwave, slow cooker, steamer, toaster, kettle all crockery, utensils, pots and pans etc. The shower room has a double shower and wash basin, with a separate toilet with hand basin. A fire extinguisher, carbon monoxide detector, smoke alarm are provided for you and your family safety. Outside has a veranda with a gate to keep the little ones safe. We also have a patio table and chairs. Parking is on hard standing at the side of the caravan. Theme park passes are not included in the price, they must be purchased on arrival at reception. We think you will find our prices competitive. This is a no smoking caravan and strictly no pets.